Ever get a craving that can never seem to go away? Bacon, for example: when you think of that crispiness, the savoriness…well, you can’t stop until you get it. Then once you have it, well, you have to have it again. Sorry, did I just make you hungry? Don’t hate! Well, we had one of those cravings a few weekends ago: bbq (that’s me) AND mac & cheese (yeah that’s Kristien of course). Believe it or not, it’s not that easy to get both together (and have them both be good). We had two great options that rocked both: Q in Port Chester and Bobby Q’s in Westport, but we were so hungry that we couldn’t drive 30 minutes. We needed that food STAT so we sped on over to Ash Creek Saloon in Norwalk. Our jaws dropped when we found out there’d be at least a 20 minute wait, but we made the best of it and saddled on up to the bar. Now, pardners, we ordered from a decent list of draughts, but before we could finish our table was ready. Don’t you love those nice surprises in life? We got our strategy underway: buffalo wings, mac & cheese, and some bbq. We couldn’t figure out what BBQ, so we figured…hey, why not get it all with The Posse? Yeah, we had to bake Christmas cookies the next day anyway, so we could use leftovers for fuel. 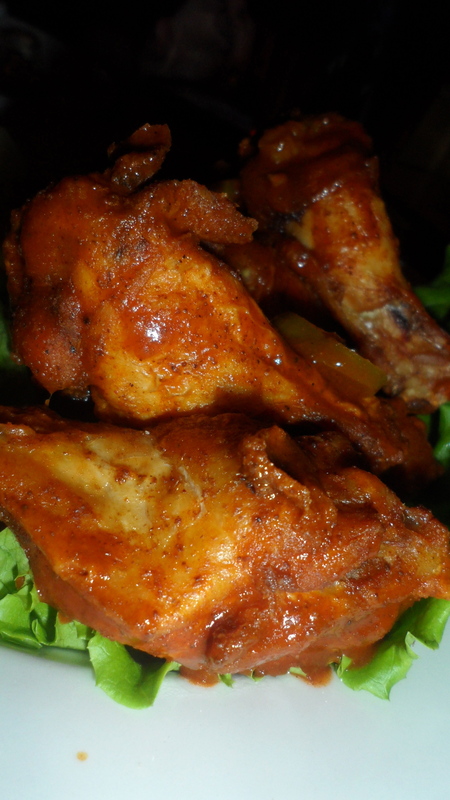 Our wings came to us, steamy, warm, and dripping with a sweet and tangy hell-fire sauce. There was definite heat going on, but it wasn’t overpowering at all. Evidence of heat? Sliced jalapenos were strewn about the wings and were steeping in the sauce. The meat was cooked nicely, wasn’t dried out, and was nice and juicy. Our problem with the wings, though, was that they weren’t crispy enough like you come to expect. Monster B’s, for example, were nice and crispy, had great sauce, and still kept the meat juicy. 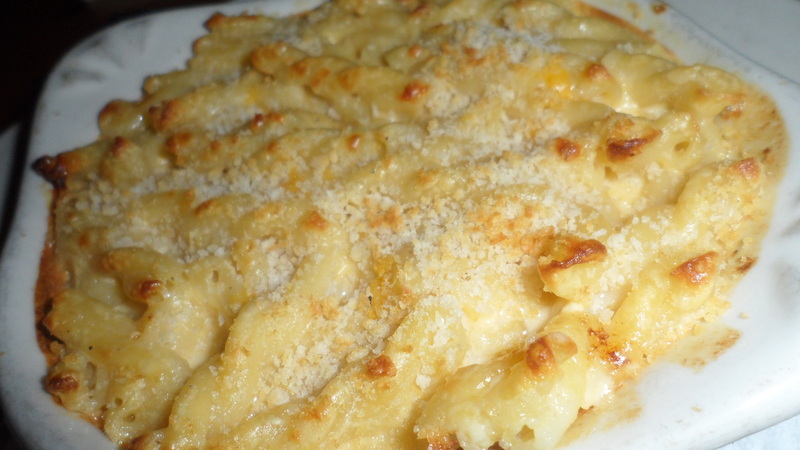 The baked mac & cheese was good too with golden breadcrumbs on top. This is more of a solid, baked, less liquidy kind of mac & cheese. The flavors were almost there, but it could have used just a few more hits of salt – it was kind of bland. $47 for two people ($23.50 for each additional person) gets ya Shorty’s baby back ribs, Memphis dry rub ribs, bbq chicken, bbq sausage, brisket, sweet potato fries, french fries, coleslaw, cornbread, and beans. Holy crap, did we actually eat all that? First, we have to say that everything was cooked so well here. The chicken skin was well-flavored and was nice and crispy, while the meat itself was juicy. The ribs were delicate and fell off the bone with just a slight tug. 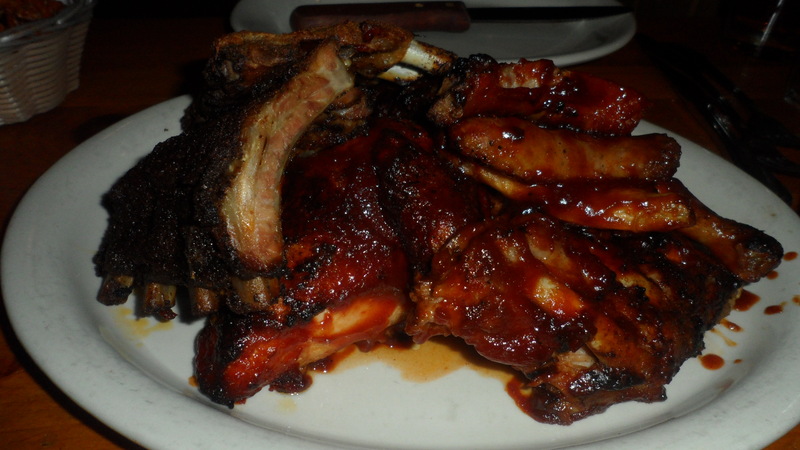 On the ribs, though, was a very sweet sauce that became very overpowering. Kristien was not a fan. The sausage was interesting because it tasted like an Italian sausage with fennel. I mean, who the heck doesn’t like Italian sausage, but served as bbq sausage? Meh, not so much! Last of all was the brisket and that comes pulled apart for you. It was delicate, tender, and full of flavor, but definitely different than a typical brisket. Kristien would’ve liked it with more fat – yeah that’s how she likes her brisket. Can you blame her? Onto the sides that came with The Posse! 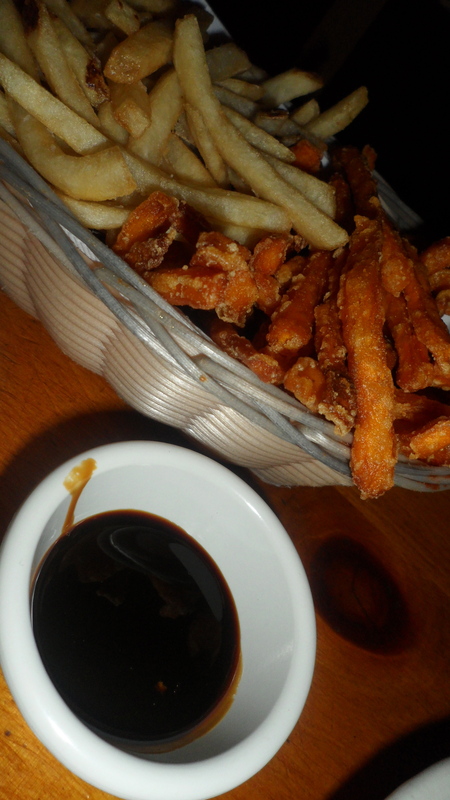 The major reason to come to Ash Creek Saloon is to have the sweet potato fries that come with a lovely and sweet molasses sauce. They come out crispy, hot, and ready to dip. Ahhhh. SO GOOD! The french fries, though, were soggy and not so good…so we just ate more sweet potato fries. Kristien took ownership over the coleslaw. It was seasoned well and had a tangy kick, but had just a little too much mayo. I lorded (or larded?) over the beans, cooked with nice chunks of pork. The pork added great flavor and a smokiness to the beans, but it could have used a bit more brown sugar to sweeten it up. Last stop was the cornbread. It’s that kind of cornbread that’s heavy and solid, close to the consistency of a muffin. Yum! You feel about 20 lbs. heavier after downing a slice, but hey, it’s Saturday. Calories don’t count on Saturdays, duh. Ash Creek Saloon is a good, go-to place for grub and bbq food. You’re not going to get the bbq that you’ve been dreaming of your whole life, but it’s certainly satisfying. They cook the food nicely here, but with just a bit more (or maybe a bit less) flavor and seasoning, the food would be closer to great. The Posse is definitely a cool way to go if you want to try all of their bbq at once…especially if you enjoy bbq leftovers. SO MUCH FOOD! Great post! Yes you did make me hungry! Those sweet potato fries sound awesome! Sorry, Marissa. :) Now I’m hungry because I remember writing about bacon! :) Seriously, you need to eat those sweet potato fries…redonkulous. Yeee haww! We feel so bad, we want to definitely hang out and try some bbq. You ever been to Smokey Joe’s? Maybe we try that one together?